If a copper tankard and a mug had a baby you would have what we have here... a genuine Moscow Mule mug, in this case by Pure Copper. Lately these have been exploding in popularity which is interesting since the corresponding drink of the same name and mug was all the rage in the 1940's. According to my mixology guru Mittie Hellmich, who's book would be perfect with a set of these mugs, the Moscow Mule was the cocktail that made vodka cool for the masses. Teaming up with a Hollywood restaurateur, importer John Martin combined ginger beer with a twist of lime and the Moscow Mule was born. Originally the Moscow Mule mugs had kicking mules engraved on them but all the ones I've found today are plain and quite striking. 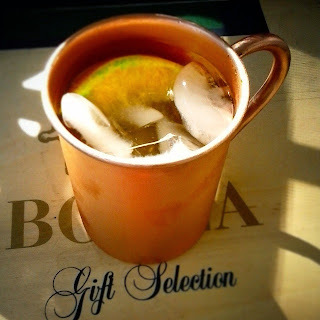 The drink itself packs a kick but is also pretty simple to make with vodka topped with ginger beer, lime and ginger candy; served in a traditional chilled copper Mule mug. Find the above copper mug over here. Sounds like a great drink! Might just have to make this for myself first before giving it to Dad... lol! Thanks for sharing this recipe!